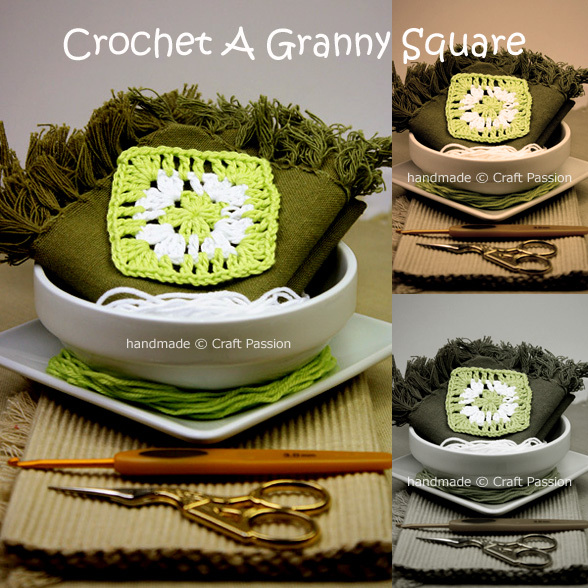 Use yarn and matched hook size. 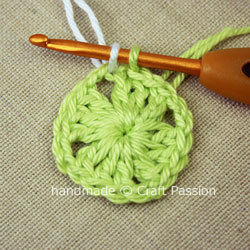 Pick your favorite yarns’ colors and use the correct crochet hook size according to the yarn of your choice. 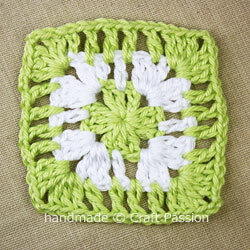 This granny square demonstrate here uses 3 color, green and white. Round 1: ch3, dc2, ch2,*dc3, ch2* repeat 3 times, to form 4 dc cluster on the 1st round. 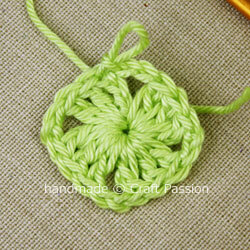 sl st to the 3rd chain, continue sl st on the loops of the following 2dc. 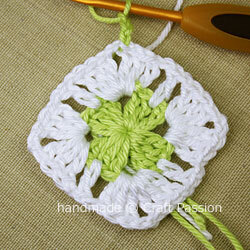 To change color, insert hook to the 1st chain after the dc, draw white color yarn over, sl st and get ready for the round 2 crochet. Round 2: [White] ch3, dc2 in next space, ch2 [form corner], dc3 in same space, ch1, dc1 on the center dc of round 1 cluster, ch1, *dc3 in next space, ch2 [form corner], dc3 in same space, ch1, dc1 on the center dc of round 1 next cluster, ch1,* repeat 3 times, sl st to the 3rd ch at the beginning on this round, continue sl st on the loops of the following 2dc and change yarn color. Round 3: [Green] ch3, dc2 in next space, ch2 [form corner], dc3 in same space, ch1, dc1 on the center dc of round 2 next cluster, ch1, dc1 in next space, ch1, dc1 in next space, ch1, dc1 on the center dc of round 1 next cluster, ch1*dc3 in next space, ch2 [form corner], dc3 in same space, ch1, dc1 on the center dc of round 2 next cluster, ch1, dc1 in next space, ch1, dc1 in next space, ch1, dc1 on the center dc of round 1 next cluster, ch1* repeat 3 times, sl st to the 3rd ch at the beginning on this round, fasten off, or you can add as many round as you like by adding 3 sets of ch1, dc1 for each round between the corner cluster. 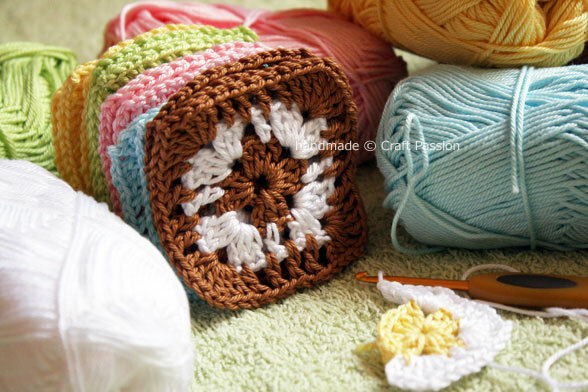 Weave in the ends in between stitches and hide them away.